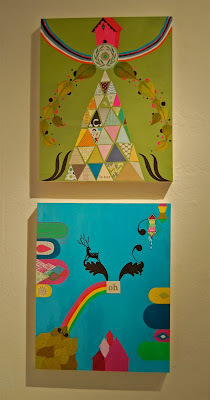 This past Friday, I went to the opening of Mati and Lisa's show at the Curiosity Shoppe. 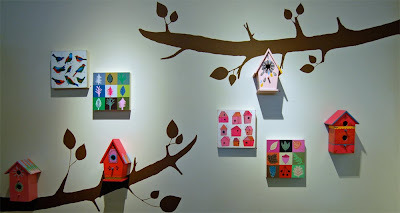 The show is entitled Little Pink Houses. The first thing I noticed while walking towards the store is how many people were hanging out right outside. As we squeezed our way into the store to see the installation, I ran into Mati in her lovely pink dress. 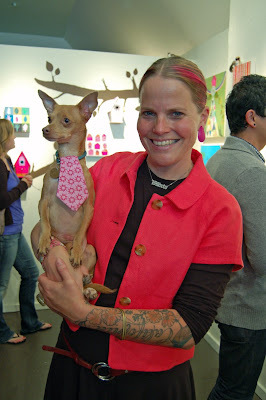 By my feet was the ever cute Wilfredo wearing a pink necktie just for the occasion! I expected lively paintings and cute pink houses. These 2 artists did not disappoint. 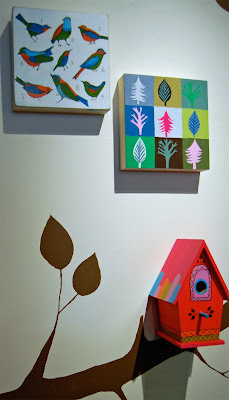 The show is an explosion of color, whimsy and nature. If you are in San Francisco, you really must see it in person, the show will be up until July 31. Alternatively, the art work is also available online. Hello! I just stumbled across your blog via Flickr. 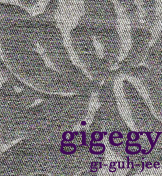 I was curious about a picture you have on there... the aqua mesh fabric with flowers sewn in.. where did you find that? My sister is planning a wedding and aqua is one of her colors... we love that fabric! I actually bought that at Jo-ann Fabrics a few years ago so I'm not sure if they still have it.